As a long time member of Jamplay (yes, even teachers are still learning! ), I thought I'd share with you some key reasons why I highly recommend it to my students. Jamplay is a premium guitar lessons site with a huge library of high quality video lessons, delivered by more than 50 pro tutors (including some influential guitarists of our time). It also offers regular live webcam sessions, jam tracks, a song library and one to one support for its members. Basically, everything you need to become the best guitarist you can possibly be in one place. Free lesson sites and Youtube videos are great, but their resources are limited by far smaller budgets. Jamplay offers a far more professional, step by step approach than regular Youtube videos or free sites. So here's my Jamplay review - some of the key benefits of taking your next (or first) step with their course. But please don't just take my word for it. Take a moment to read what others are saying about it from an independent site. If you've often found yourself jumping around the internet trying to piece together lessons and tips, you'll know how frustrating learning online can be. You just need a clear, logical learning path from where you are now to where you want to be. As you move through these sections, you'll never get lost or be left out in the cold. It's as simple as "when you've learned this, go here next...". If you want to learn songs, their licenced song library is one of the (if not the) largest available and they break songs down part by part, note for note. You can also learn in phases. 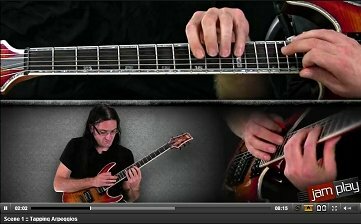 This is a logical step by step path through the entire Jamplay lesson library, from absolute beginner through to advanced. Great if you don't know where to begin... or go next. When you begin, you have a number of tutors to choose from. The idea is that you spend some time with each tutor, get to know them and go with the one (or two) you find has the best teaching style for you. Some tutors I found "hummed and harred" a lot (although some might prefer the unscripted, informal feel of it), some were more succinct than others, but there is a huge benefit of having multiple tutors at your disposal - some will include tips and methods that are unique to them. Each tutor is different and approaches teaching in different ways. You can sample Jamplay's free lessons from each category and tutor by visiting their lessons page. Multiple camera angles, and accompanying tabs and chord/scale sheets mean you're never second guessing where to put your fingers. Over-the-shoulder view shows you the fretboard how you see it when you play. It's surprising just how much clearer seeing the fretboard this way is as opposed to head on. ...A/B looping allows you to set any two points in the video and repeat that section. I found this really useful when the tutor slowed down to show you a lick. 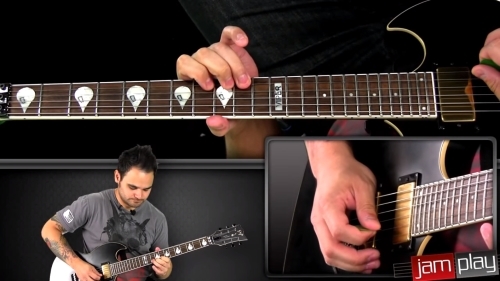 No more constantly hitting back on the time bar - you can keep both hands on the guitar. Also, lesson bookmarking means you can come back to a lesson you're not fully confident with, all your bookmarks being stored in your personal lesson planner. 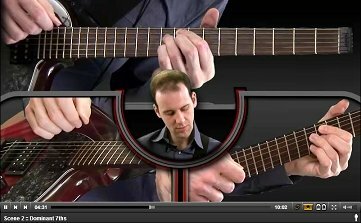 Below each video is the supplemental content section - printable tabs, chord and scale charts, jam tracks and a text rundown of the lesson. Here you can also ask the tutor in the video questions about anything you don't understand. The only gripe I have (and it's more just me being picky) is that sometimes the split camera angles aren't always necessary. But in most videos they are genuinely useful and make an effective change from the traditional "head on" view. It would also be great to choose your own camera angles throughout the video. Something for the pipeline! Another unique feature of Jamplay is their live community based lessons, boasting 8 hours of live sessions, 7 days a week. JamChat allows students to interact with the tutor live. There are also "open mic nights" which allow you to showcase your talent over webcam, if that's your thing. Many see this as the defining feature of JamPlay and it really does raise the barre (sorry) for other online lesson sites. As well as the video lessons they also offer several integral features such as a comprehensive chord and scale library, a library of jam tracks, interactive games, a lick and riff library and custom progress reports which I thought was particularly useful for tracking your progress in a given lesson, noting down bits that you need to work on more, or bookmarking a cool riff you came across. I find it very simple to use as all your bookmarks are linked from one place. As far as learning guitar online, Jamplay offers by far the most interactive and comprehensive learning experience available. You can get unlimited access on a monthly or yearly basis (note: see my discount codes below! ), which is pretty reasonable considering the number of hours of video, live webcam sessions and the various libraries and tools. If you want the absolute best learning experience but can't afford pricey one-to-one lessons, Jamplay is the best compromise you'll find. Copy and paste one of these codes into the coupon field when you sign up to get a discount on membership. More coupons added when they become available!